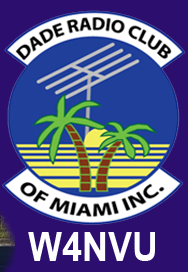 August 2010 Meeting Minutes – W4NVU – Dade Radio Club of Miami Inc.
Meeting was called to order at 19:48 with 14 present. Ernesto was not present tonight. Jason Bunch presided over the meeting and welcomed everyone. The meeting was broadcast live on the air tonight from the EOC. Testing is being done in the other room. The microphone was passed around the room and everyone took turns and stated their name and call sign. Jason welcomed everyone again. We have a quorum. We do not have a guest speaker tonight. Carl spoke about the 444.200. It’s working. Robert was not present tonight and it is still not working. Jason asked if there was any more old business. There was none. Merritt spoke about an Alpha Numeric paging system to be used for Hams. Brand new and fully synthesized goes for about $80.00. He explained how it works and how helpful it would be in all types of emergencies and events. He will conduct a table top demo at the next meeting. Dave came in and we have a new member – Richard Terrelonge. Welcome Richard. Carl spoke about RACES. There is going to be a drill the Wednesday after next requesting damage assessment information. You can get the form from the OEM website at Miamidade.gov/oem/consumer.asp. You will call in on the radio and give a house number (address) and zip code. There are 4 pictures and you report what it looks like. He will post it on South Florida Hams. He read the RACES List and will post it on South Florida Hams. The next meeting we will have another EOC tour. John Hall asked for a financial report, but Esther is not present tonight. Dave suggested that we take some money from our treasury and invest it in CD’s. Since we no longer have a Hamfest to generate more money. We need an investment committee. We will discuss this at the next meeting. He also wants to vote to add $10.00 to the South Florida Repeater Council. Carl then had 2 door prizes that were given up. Joanne announced that she will not be at the next meeting because she will be working. Jason asked if there was any other business. With no other business, Jason thanked everyone for coming. A Motion to close the meeting was made by Dave, seconded by Caesar. Voted and passed.